Seafood grilled on a plank is common enough, but have you tried clinching as a grilling technique? This is one of the many new ideas for cooking on the grill from Adam Perry Lang. I attended a class he taught recently at Central Market Cooking School with a media pass, and a copy of his new book Charred and Scruffed was included. He came up with the idea of clinching as a way of “closing the gap” between the burning coals and the food being grilled. By placing the food directly on the coals allowing no space between coals and meat, there’s no chance of flare ups from dripping fats. You get a very quick sear. Ordinarily, Kurt is the grill master at our house, but he wasn’t able to attend the class with me. So, I attended a class involving more red meat than I normally see in an entire year, just so I could pass all the information on to Kurt. Truth be told though, I was fascinated to learn more about cooking over direct flames and all the other great tips that were mentioned throughout the class. We were taught about “active grilling” which means the food is moved about the grill the entire time it cooks. That way, rather than worrying too much about grill marks, you can check for hot spots and be sure the food is cooking evenly. Basting was another important topic as was adding flavor at every point possible. So instead of using a silicon or natural bristle basting brush, one was made with herbs tied to the bottom of a wooden spoon. Then, the basting liquid itself and the herbs that form the brush add flavor at the same time. Throughout the active grilling time, each time meat was turned, it was immediately basted. The goals were to develop flavor while a nice crust formed as the meat cooked. One dish I probably won’t recreate at home, but maybe Kurt will, was the Rib Roast Done Like a Steak. With baseball bat in hand, Perry Lang bashed an entire rib roast of beef into a thick steak for grilling, and the class moved outside to watch the master at work in front of the grill. I’ve posted photos from the class on my Facebook page including one of the baseball bat maneuver. In Charred and Scruffed , you’ll find all of the grilling tips and recipes for cooking every cut of beef as well as pork, chicken, lamb, duck, lobster, fish, shrimp, and game over coals. There are also brines, bastes, finishing salts, and side dishes. We tasted the Tomato Spackle, which is like an extra-thick homemade ketchup, during the cooking class, and there are recipes for an Artichoke Spackle and Hatch Chile Spackle in the book that I want to try too. First, I had to attempt something on the grill from the book. 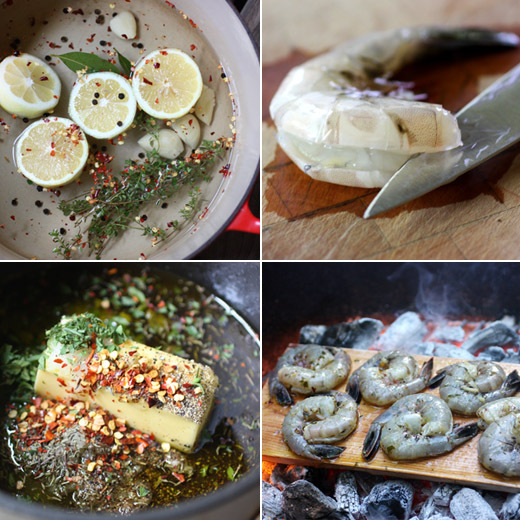 For the shrimp, layers of flavor were developed by starting with a brine. I made the basic brine which included water, salt, sugar, lemons, bay leaves, garlic cloves, thyme leaves, black peppercorns, and red pepper flakes. The brine was brought to a boil to dissolve the sugar, and then it was chilled in the refrigerator. The shrimp were cleaned, the shells were cut down the back so the shrimp could be deveined, but the shells were not removed. The shrimp spent an hour in the chilled brine before being cooked. Meanwhile, the plank was soaked in water. Another layer of flavor was developed by making a basting liquid with olive oil, butter, garlic, onion, oregano, salt, pepper, red pepper flakes, and lemon. After taking the shrimp out of the brine, they were tossed in the baste before being arranged on the soaked plank. The plank was placed directly on the hot coals in the bottom of the grill, and the water from the plank steamed as soon as the plank hit the coals. The lid of the grill went on, and the shrimp cooked in just a few minutes. Despite the near-direct heat of the coals, the shrimp were well-protected by the plank and their own shells. They were probably the tenderest grilled shrimp I've ever tasted. And, there was great flavor from the brine and the baste along with the smokiness from the grill. I’ll be happy to coach Kurt when he feels like grilling red meat, and when I want to grill fish and fowl, I’ll be grabbing this book for tips. A wonderful way of preparing shrimps! I bet they taste really good. These sound like perfect little morsels Lisa. This is definitely an interesting technique. I will have to pass it along to my friends that grill. So interesting how you prepared the shrimps...and from your description I can almost taste them...YUM! I love the different techniques! aw, they're hugging! i've never seen shrimp prepared or served like that--very clever! This is why I love your blog. I'm a pretty experienced chef but I always seem to discover something new when I visit you. I'm definitely trying this as soon as possible - brilliant! ps. Love all the photos, too - especially the one of the closeup shrimp. This is completely new to me! I loved reading about it....wish I could take a class like that. Lucky you! 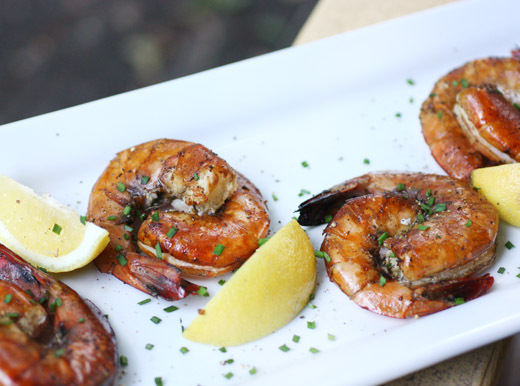 The shrimp look fabulous and I'd love that smokey briny flavor. Will check out Facebook. Great tips! The term "clinching" is new to me. Thanks for all the info - the book sounds great. One of my friend's mom told us before that anything cooked using charcoal is different from those cooked directly on the stove/oven. Looking at your delicious shrimps has reminded me of this very fact. Clinching is a new one to me but it sounds intriguing. I'll have to ask Eric if he's heard of the technique- if not, I know he'd be interested. I can just imagine your horror at watching an entire rib roast being pummeled into a steak- you're both intrepid and a trooper to face down all that red meat just to pass the information on! I don't know anything about grilling. Hubby takes care of it. This post would be very ful to him , i am sure of that. And those shrimps are seriously making me hungry for some! A novel way of cooking shrimp. A great discovery. The brine itself is packed full of flavour so I'm sure the shrimps must have been so good! 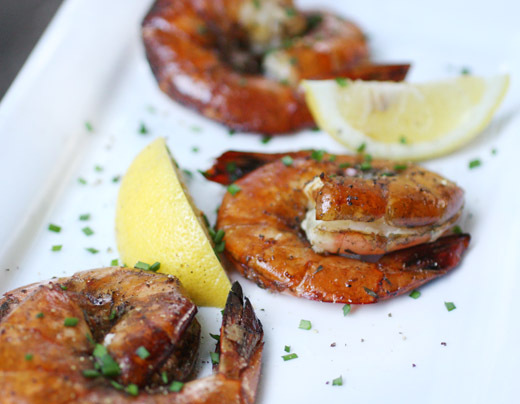 I've never see shrimp with the exquisite mahogany sheen as in your tempting recipe! I certainly need to expand my grilling skills, well done! This looks lovely, your pictures are great! This looks delish! Congrats on Top 9! !